Some of you may know that April is Autism Awareness Month, and even more specifically April 2nd is World Autism Day. According to the Centers for Disease Control and Prevention, Autism affects 1 in 50 American children; it is the fastest-growing developmental disability. About 67 million people in the WORLD are affected by this diagnosis, which to date has no cure and causes of its initiation are still vague. It is a steadily growing and concerning issue that affects millions of families throughout the world and for some of us very close to home. You may have heard the expression “Light it Up Blue,” whereby companies, communities, schools and individuals throughout the world come up with blue inspired activities to spread the word and promote awareness. 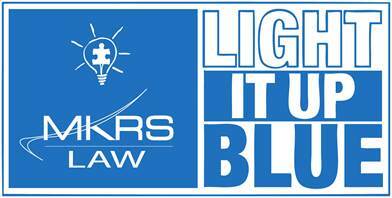 This year, MKRS Law is joining the worldwide efforts again to Light It Up Blue on Wednesday, April 2nd by wearing jeans and a blue shirt with a donation. All proceeds will go to a local charity that promotes, educates, and assists families within the spectrum. Through awareness and intervention initiatives and programs, both private and governmental, our special children continue to thrive. Spread the word to your own offices and social media to show support. You can learn more on Autism Speaks.